New paper from NOAA demonstrates that El Niño has more impacts than climate on winter weather in the USA | Watts Up With That? Weather forecasters have long known that El Niño events can throw seasonal climate patterns off kilter, particularly during winter months. Now, new research from NOAA and the University of Washington suggests that a different way to detect El Niño could help forecasters predict the unusual weather it causes. A network of buoys that spans the Pacific, the TAO-Triton array, observes conditions in the upper ocean and is essential for forecasting El Niño months in advance, and for monitoring it as it grows and decays. A new study, just published in the February issue of the Journal of Climate, describes an atmospheric El Niño signal that is very strongly associated with U.S. winter weather impacts. Ed Harrison, Ph.D. of the NOAA Pacific Marine Environmental Laboratory in Seattle and Andrew Chiodi, Ph.D., of the NOAA Joint Institute for the Study of the Atmosphere and Ocean at the University of Washington, co-authored the paper. Harrison and Chiodi looked at all El Niño events that were identified by sea surface temperature measurements since 1979. They then examined satellite imagery for these events and found that a subset of the events showed a sharp dip in heat radiating from the tops of deep convective clouds, an indicator known as outgoing long-wave radiation or OLR. When comparing the El Niño events to historical weather records, the scientists found that the El Niño events with drops in OLR were the ones most likely to play havoc with winter weather. They also found that El Niño events with no corresponding drop in OLR did not produce statistically significant anomalies in weather patterns. The dip in heat from deep convective clouds usually occurred before winter, so the timing of the signal could help forecasters improve winter seasonal outlooks, the scientists said. “By sorting El Niño events into two categories, one with OLR changes and one without, forecasters may be able to produce winter seasonal outlooks with more confidence than previously thought possible,” Harrison said. El Niño refers to a warming of waters along the equator in the Eastern Pacific Ocean. Through its influence on the atmosphere, El Niño shifts tropical rainfall patterns which causes further shifts in weather around the globe, including milder winters in western Canada and parts of the northern United States and wetter winters in the some southern states. Industry sectors from energy and construction to transportation and tourism are keenly interested in how El Niño will affect their costs. El Niño-influenced weather can affect fuel oil demand, travel delays, and retail sales. Better accuracy in El Niño predictions could help industry to prepare for its impacts more efficiently. This study shows that, since 1979 when outgoing longwave radiation (OLR) observations became reliably available, most of the useful U.S. seasonal weather impact of El Niño events is associated with the few events identified by the behavior of outgoing longwave radiation (OLR) over the eastern equatorial Pacific (“OLR–El Niño events”). These events produce composite seasonal regional weather anomalies that are 95% statistically significant and robust (associated with almost all events). Results also show that there are very few statistically significant seasonal weather anomalies, even at the 80% level, associated with the non-OLR–El Niño events. A major enhancement of statistical seasonal forecasting skill over the contiguous United States appears possible by incorporating these results. It is essential to respect that not all events commonly labeled as El Niño events lead to statistically useful U.S. seasonal forecast skill. Chiodi, Andrew M., Don E. Harrison, 2013: El Niño Impacts on Seasonal U.S. Atmospheric Circulation, Temperature, and Precipitation Anomalies: The OLR-Event Perspective*. J. Climate, 26, 822–837. paywalled. If there is an AMS member in the house, it would be nice to know which are the El-Nino periods with the drop in OLR. I wonder of they correspond to Bob Tisdale’s events with the temperature step?. It would also be nice to know if they have thoughts on why the OLR drops. Ok, so basically it seems to be saying to me: if the heat is not radiated by deep convective clouds in the equatorial region, then the heat will get radiated someplace else, such as in North America during large storms there. I haven’t read the paper and I don’t even know if they included the data I am thinking of, but I would be willing to bet that there is some correlation between the reduced OLR events and the behavior of the trade winds in the region. I also have a hunch those trade wind changes would even lead the OLR changes so you could get advanced notice that you have a higher probability of an OLR event, and then get that confirmed when you start measuring the OLR and at that point are pretty confident that you are going to have a potentially “active” winter in such places as coastal California. I think it’s very interesting to combine this with Bob Tisdale’s insights on the stepwise effect of ENSO on SST. It seems that the steps that he has identified coincides with “OLR La Niña events”. And there was a strong “OLR La Niña” before the satellite temperatures that Bob discusses – in 1976, the year of the Pacific climate shift… very, very interesting! A friend at the Scripts Institute and UCSD involved with the research and the Pacific Buoy program said they have enough raw data to occupy several super computers for decades to process it to a conclusion. I can tell you all that they cherry pick data sets to gain more GRANT MONEY from industries around the world. They send our speakers to ask for money and they twist arms – JOBS are on the line HUH? ** evaporation and latent heat leading to convective weather and the release of latent heat of condensation and fusion leading to OLR from the convective weather. ** generation of winds that lead to changes in the trade winds and the movement of weather systems. If more energy becomes kinetic then the OLR will be reduced and the weather patterns will be different to times when the energy is mainly lost in convective transport to the tropopause. The use of energy from SST as kinetic energy changing the weather patterns should be expected to have more global effect than just larger convective storms. I will note that we’ve had snow on the ground in NE Ohio longer this winter than many I can recall of the recent past. Since a few days before Christmas to today, we’ve had snow cover all but maybe a week and a half. Without seeing the data and stats, it sounds to me that the OLR drop is significant in changed weather patterns and El Nino isn’t (or at least less significant), which is quite a surprise. And what’s the physical mechanism for the drop in OLR? The more we know about the climate, the less we know. When will you deniers realise that the main climate driver is now the trace rise of the trace gas co2? The human fingerprint is steering the wheel. Now, what was that recent excuse for the temperature standstill? Natural climate variations I recall. Oh, never mind, even though at least 1 model rules out 15 years of a temperature standstill with 95% confidence. Espen, thanks for the link to the poster. 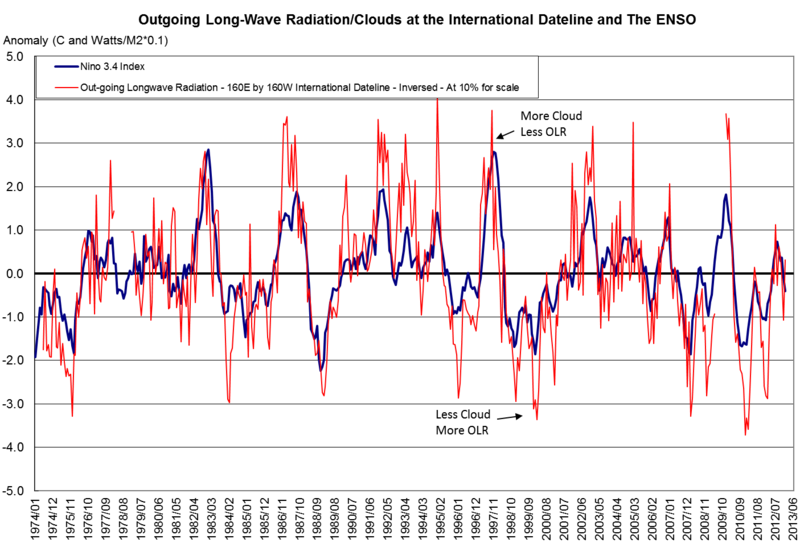 ENSO versus Outgoing Longwave Radiation at the International Dateline region. The study is correct in that this how the ENSO impacts climate in other regions and globally and it does vary some from event to event. OLR data source and Nino 3.4 values. It is really the convection clouds from the relatively warm (or cold) water that makes the difference here. The convection clouds form when there is an El Nino and there can be nearly continuous cloud cover. The clouds hold more of the heat in (reduced OLR) which then spreads across the planet (if sustained long enough). The opposite occurs during a La Nina. The OLR changes here are truly massive at +/- 50 W/m2. And they may not always be in the International Dateline region. Last month, for instance, the ENSO-like cloudiness was a little south of this area but it produced extremely low OLR values and the SH heated up by a large amount as a result. (This cloudiness has ended now and left in its wake an extremely cold ocean region since it got no Sun for 2 months). Daily OLR values here. Blue is more clouds and reduced OLR and signifies the planet heating up. Larger Yellows are no cloud and high OLR and planet cooling off. To sum up the abstract: El Ninos can and do have different impacts on US climate and assumedly have diffrerent impacts on climate globally. MiCro @ 2:43pm, Welcome to the world of my childhood. I grew up in Cleveland in the 50’s and early 60’s. The weather was either gray or for variety, gray with snow. Thanks to Bob Tisdale we already knew part of this! Congratulations to the authors on identifying data that might reveal an important natural process that is associated with El Nino. Sounds like science to me. We might have a mature climate science by the year 2100. So very simply, it’s the strongest El Ninos that have the strongest impact on weather patterns. So what does Mother Nature do? She may have recently switched us to a regime of weaker El Nino events. It’ll be interesting to see if these weaker El Nino events persist for a while. Bob, correct me if I’m wrong but El Ninos allow the warm waters at the surface to bleed off like an open artery. So it isn’t that SST become warmer, it is that the ocean is releasing heat that has sloshed back into the basin at the surface into the atmosphere. So then it is the released heat in the atmosphere that creates some unusual weather patterns. However, under heat soaking La Nina conditions we experience another set of perverse weather-related affects. My interpretation is that some El Ninos as measured by SSTs aren’t. That is, the existing El Nino indices are measuring 2 different and perhaps substantially independent atmospheric/ocean processes. Mon. Wea. Rev., 110, 1405–1416. El Nino involves a wholesale warming of the normally cool near-equatorial Pacific east of the International Date Line (say, from Ecuador to the mid-Pacific). When that ocean warms, air rises and creates convection (thunderstorms) where normally the atmosphere is quiet and clear. The rising air creates a Hadley circulation (google or wikipedia those words) that generates a jet stream in the upper troposphere to the north of the thunderstorms. During el Nino, the comvection-caused Hadley circulation creates the jet stream far to the east of its normal place over the western Pacific. The el Nino jet stream cuts into Mexico and the southern US, and the cyclone/storm track that normally crosses the northern US now tracks across the south, from California to Florida. So the South has a cold & stormy winter, while the northland from Seattle to North Dakota to the Great Lakes is mild & dry. Now, that OLR – it’s what’s measured by the infrared heat-seeking satellites. If the measured OLR is less, the tops of the clouds are colder (thus radiating less energy) and therefore higher. Higher clouds means taller thunderstorms and more rising air and more Hadley circulation and a stronger jet stream. More OLR means more IR coming from not-as-tall clouds, or even from the cloudless ocean surface. That means little or no convection. And OLR has very little to do with the warming or cooling of the planet. All of what I’ve said above is nothing new – we’ve been saying this for 30 years – but what’s new with this paper is that some Ninos are better than others at pumping up that jet stream. I take this to mean that CURRENT predictions are useless to energy/construction/trans/tourism industries, and they ignore them. And even if they trusted the forecasts, how would they behave differently? Who does it help to know that winter snow will be heavier this winter, so look out for more traffic delays in two months? The “OLR La Niñas” that they identify are: 1974-75, 1975-76, 1988-89, 1998-99, 1999-2000, 2010-11. I think that these La Niñas correspond quite well to the stepwise warming Bob Tisdale has identified (except that Tisdale identifies a period from 1984, but IMHO that period may have started in 1976 instead), and there’s also an extremely simple physical explanation: When there’s a La Niña with cloud-free conditions, the Pacific ocean accumulates heat from the sun.